The new Taxonomy Restriction feature allows WPUF admins to restrict users to post on a taxonomy/category based on subscription pack. You will be able to limit the kind of posts your users can make by allowing them to post only in specific categories of your choice. Navigate to wp-dashboard->User Frontend->Subscriptions. Then click on Add Subscription. From here, fill in the details. 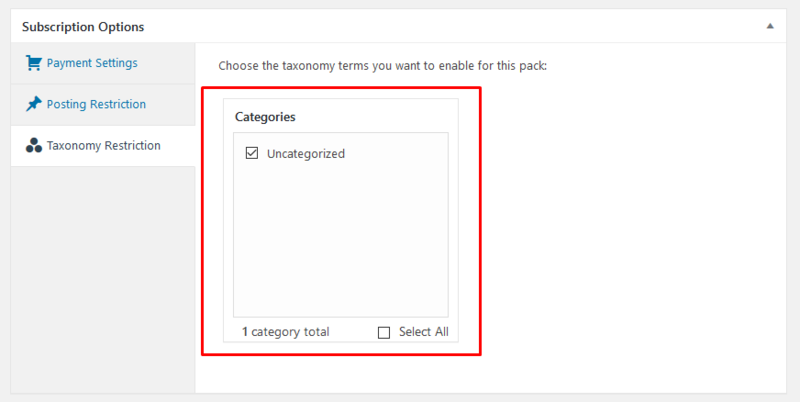 Click on the Taxonomy Restriction tab to choose the categories you want to allow your users for this pack to make posts in. The box will list all your categories. From here you can choose some or all categories that you want to allow for a certain pack. Do the same process for every subscription pack you create.